The App has more than 30 baby food recipes to help mothers to make their own babies meal. The App has homemade recipes for baby food and contains Avocado, banana, Apple,sweet potato,chicken,baby cereal and lot of puree. Food recipes for baby which has been dividend according to age group of 6 to 8 months, 8 to 10 months, 10 to 12 months, 12 to 20 months and every category contains four sub categories fruit,vegetables, protein and nutrition. The App has more than 300 recipes. 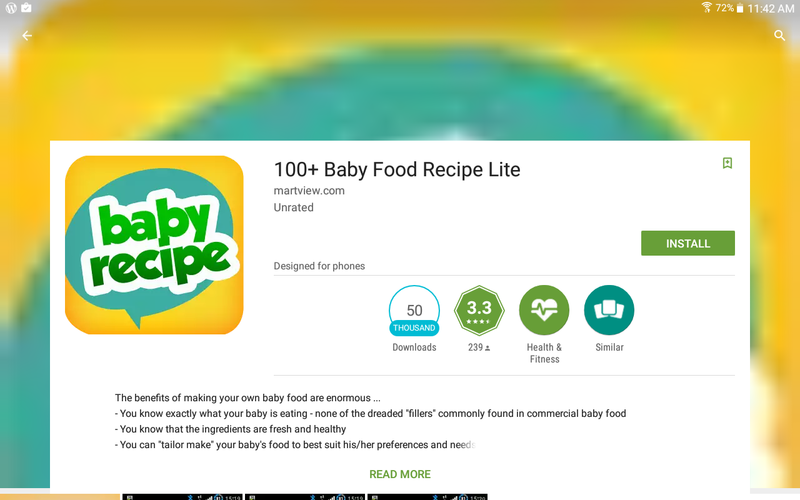 The App discusses baby food in detail with diversification table,over 100 recipes, pediatrician review for all allowed ages,possibility to recipes and articles. The App contains in depth information about baby food and recipes and also about babies and how to feed them and what to expect from babies. It helps in getting answer to most of the commonly asked questions.